Please use the information below to connect with us. Rt-315 south to I-71 south (past I-270) to Stringtown Road/Exit #100. Stay in the right lane and go a short distance on Stringtown Road to Marlane Drive. Turn RIGHT on Marlane Drive (this is a sharp right turn by the “Welcome to Grove City” sign). Follow Marlane Drive to Brookham Drive. Turn LEFT onto Brookham Drive (Mid-Ohio Foodbank will be on your right). Park anywhere on either side of the lot. The main entrance is under the Mid-Ohio Foodbank sign. I-270 south to I-71 south/Exit #55 (toward Cincinnati). I-71 south to Stringtown Road/Exit #100. Turn RIGHT on Stringtown Road. I-71 north to Stringtown Road/Exit #100. Turn LEFT on Stringtown Road. Get in the right lane and go a short distance (just past the I-71 bridge) on Stringtown Road to Marlane Drive. Please note: If you miss the turn on Marlane Drive, proceed to the traffic light and turn RIGHT on Gantz Road. 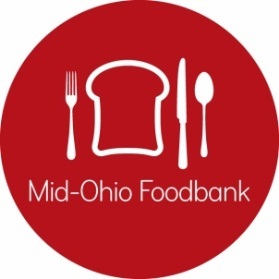 To inquire about meeting space rental or a tour of Mid-Ohio Foodbank, please email Gloria McCoy or call 614.317.9453. Looking for an opportunity to help our friends, family, neighbors and community? Visit our Career page for more information. Tuesday: 10:00 a.m. – 3:00 p.m.
Wednesday: 5:30 p.m. – 7:30 p.m. Learn more about the Kroger Community Pantry. Please plan your shopping accordingly. Thank you for your understanding.